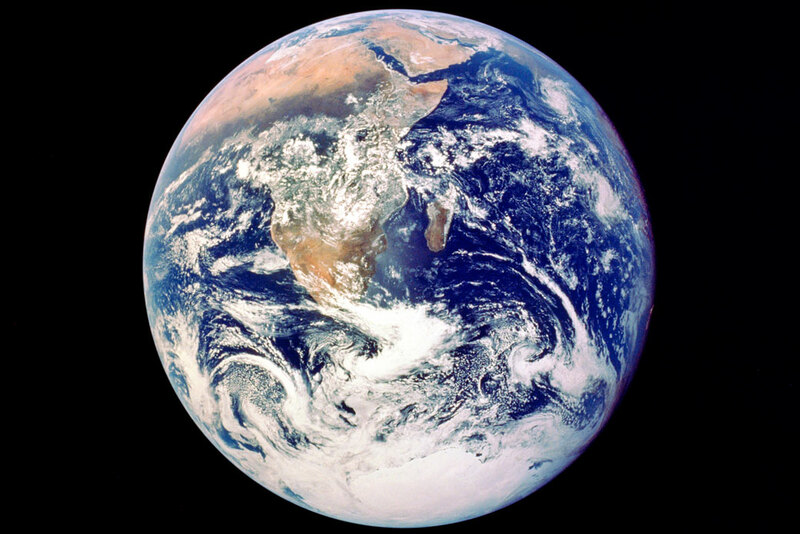 View of the Earth from Apollo 17 in space, December 1972. President Trump and his allies threaten to defund and thus dismantle vital climate and energy data and research programs as part of their broader attack on science. Since human-caused changes to the Earth’s climate were first identified in the late 1800s, the scientific community has continually advanced its understanding of the processes underlying observed changes, the potential impacts, and solutions. 1 Scientists are confident that we are living through the warmest period in human history and that human activities are the main cause of climate change.2 Climate science has developed due in great part to the persistent, skeptical nature of the scientific method; the dedication and mission of its practitioners; and a bounty of data and analysis. New observations and data spark scientists to hypothesize, analyze, and draw conclusions, as well as feed additional study. The U.S. Congress has long funded and defended this virtuous cycle of discovery and its solid foundation of climate and energy data and research on a bipartisan basis; nonpartisan federal career staff have managed the programs; and scientists in government and academia have advanced their findings in the United States and abroad, underpinning the international understanding of and response to the climate challenge. These champions understand the benefits of the scientific endeavor and the urgent need to combat climate change.3 To date, the abundance of climate and energy data and their increasingly diverse sources, levels of precision, and wide range of practical applications have increased Americans’ understanding of the global climate system and benefitted users from a wide range of fields, including scientists, policymakers, business leaders, and farmers, among others. Donald Trump’s presidency has fundamentally changed this state of affairs. President Trump, his political appointees, and his congressional allies have repeatedly attacked federal programs that operate or fund climate and energy data and research. With access to budget, regulatory, and other decision-making authorities, the Trump administration and the industry interests supporting it have great power and discretion over not only language, staffing, and policy direction but also the more fundamental aspects of these programs, including funding and operating climate and energy data and research programs. The Trump administration’s budget proposals and explicit attacks on science, scientists, and scientific norms indicate their intent is to undermine not just individual programs, but the entire scientific process, and in so doing to cast doubt upon the severity of the climate challenge facing the United States and the world. Trump and his allies are seizing on a moment when the federal budget and appropriations processes have become more rancorous than ever. This atmosphere has magnified fights over budget details and line items and led to multiple government shutdowns—hamstringing the federal government’s ability to function properly, putting long-term programs dependent on consistent funding at risk, and painting targets on activities that do not align with the political agenda of those in power. These issues currently affect funding for climate and energy data and research because—even where Congress took steps to maintain or increase funding for several such programs—political appointees still have broad discretion to reprogram funds away from climate change-related activities; to leave available funds unspent; to make policy changes that alter how science is used in federal decision-making; or to deny federal scientists’ requests to conduct professional travel, present their findings at conferences, or publicize taxpayer-supported climate studies. As this report details, these forces pose a grave threat to the public’s understanding of climate change, its science, impacts, and potential remedies, now and for years to come. President Trump and his allies seek nothing less than to burn the data. By targeting climate and energy data and research, the persistent, well-funded, industry-connected fringe of commentators, policymakers, and researchers who deny the science and reality of climate change are augmenting their former tactic of sowing doubt about published and accepted research by additionally seeking to tear up the scientific apparatus, root and branch. By creating gaps in data, forcing out the federal science workforce, changing how science is used to make decisions, and undermining the performance of federal scientific endeavors and partnerships, Trump and his allies seek to erode public confidence in climate science and in facts themselves. Because climate change poses unprecedented threats to the lives, livelihoods, security, and safety of the American people, monitoring, publicizing, and defending against these attacks on science is not just a matter of transparency or advocacy—it is one of survival. This report analyzes the climate and energy data and research programs the Trump administration has targeted, their history and major federal funding streams, and their status in the context of President Trump’s attacks on science. Climate and energy data date back millennia, but modern, consolidated weather and climate record-keeping and major energy analytical tools date to the mid-twentieth century.4 In the 20th century, the United States became a global scientific powerhouse, in part because of the federal government’s decadeslong commitment to funding basic and applied research across the sciences. This commitment also made the United States an indispensable part of the global scientific community studying climate change. Much like the USGCRP’s coordination of climate research across the U.S. federal government, the Intergovernmental Panel on Climate Change (IPCC) was created in 1988, under the auspices of the United Nations, to “prepare, based on available scientific information, assessments on all aspects of climate change and its impacts, with a view of formulating realistic response strategies.”14 Since its establishment, the IPCC has produced five comprehensive assessments of the scientific basis for understanding climate change and its observed and anticipated impacts on the planet, economy, and society. Work on the sixth assessment is underway, and it is expected to be fully completed in 2022. Like the National Climate Assessment, IPCC does not conduct new scientific research or monitor climate indicators; instead, the assessments synthesize the conclusions of thousands of peer reviewed studies and public and private data sets to present the best possible consensus view. Scientists from around the world participate on a volunteer basis to draft and peer review the multiple products that comprise each comprehensive IPCC assessment. These are only a few examples of how federal investments in the United States’ climate data and science programs underpin the global understanding of climate change. While other countries, notably the United Kingdom and Japan, are also home to important data sets and research programs, future IPCC assessments would be harder to complete without continued U.S. commitment, and the quality of such assessments could suffer from a reduction in available data. While this claim doesn’t accurately reflect the terms of the Paris agreement or the “nationally determined contributions” put forward by China and India as part of the Paris agreement process, it also makes the administration’s recent decision to cancel NASA’s Carbon Monitoring System seem particularly shortsighted.21 The Carbon Monitoring System enabled the remote monitoring of carbon emissions in the atmosphere, which can help verify whether countries are living up to their pledges to reduce deforestation and forest degradation (REDD+) in the tropics, for instance, as many are being funded to do under the United Nations’ REDD+ program.22 These examples point to the critical importance of the federal budget process to building and maintaining the foundation of domestic and international climate and energy research. Under normal circumstances, the White House, federal agency leadership, and Congress formulate a budget with funding levels that highlight—or demote—priorities, and each, in turn, responds to the agendas put forward by the others. The president outlines an initial agenda and funding levels in consultation with federal agency leadership; Congress responds and sets binding funding levels, or appropriations; and the president’s administration then provides specific direction to agency offices regarding spending levels based on each appropriation. The level to which each party heeds or dismisses the budget ideas of the others depends on their political relationships and the funding priorities of individual members of Congress. In the context of the Trump administration’s budget proposals, including the more recent FY 2019 budget request, the Center for American Progress performed an extensive budget analysis to determine specific line items under threat from explicitly proposed cuts or potential political interference in the future. (see Figure 2) Given the interdependent nature of climate change and energy systems, CAP focused its analysis on climate and energy data and research programs, rather than the broader analysis Novim performed. This budget analysis included those agencies that cooperate within the USGCRP, but CAP expanded its scope to capture a broader definition of climate science, energy discovery, and non-USGCRP initiatives such as energy industry data collection activities. CAP also investigated relevant programs in the DOD and other agencies that participate in USGCRP, but do not publish budget data. CAP’s analysis of the 2018 omnibus confirmed in many cases that appropriators had either salvaged or increased funding levels for many key programs and agencies. The appropriations process reports such data at aggregate levels for several agencies, thus obscuring details needed to effectively track specific climate and energy data and research funding levels. The challenge for appropriators is to strike a balance between giving direction to agencies to ensure funds are used for the purposes Congress intends and wanting to avoid micromanaging agencies to the point where they struggle to respond to new and unanticipated demands on their programs and expertise in between funding bills. However, in places where appropriators have not provided specific direction, public observers may only have access to information provided by the political appointees making funding and programmatic decisions and may therefore remain unaware of efforts to defund, reprogram, or otherwise attack climate and energy data and research programs. At NOAA, the Trump administration’s FY 2018 and 2019 budget requests proposed to completely eliminate competitively funded climate research, which provides universities, NOAA labs, and NOAA research institutes with resources to study the climate system, to the tune of nearly $40 million.41 In fact, the FY 2019 NOAA budget proposal frankly states it will “dismantle the Climate Program Office (CPO) as it currently exists,” and proposes cuts to every other item with the word “climate” in its title.42 NOAA’s budget is blatant about its large-scale attacks on “climate” programs, but for programs that contribute to climate-related research, it presents death by a thousand cuts. Cuts of less than $10 million are proposed to the Big Earth Data Initiative, the high-performance computing for water models, the Sustained Ocean Observations and Monitoring program, partnerships with universities for ocean and coastal mapping, and environmental satellite data analysis and improvement, among others.43 The 2018 omnibus appropriations bill restored funding for the competitive research program, and increased funds for NOAA laboratories and cooperative institutes, National Weather Service observations and forecasts, and other key programs—not just above the Trump administration’s budget requests but above FY 2017 actual expenditures. The EPA has faced significant challenges to its role in understanding and addressing climate change and collecting data on pollution relevant to energy systems under the Trump administration. In addition to the administration’s attacks on science and scientists, detailed later in this report, the funding levels proposed for EPA’s climate and energy programs indicate similar intentions to undermine the agency and its workforce, including by reducing its funding and size.48 Like many other agencies, EPA’s budget process enables considerable discretion for the programming of funds within appropriation codes. The U.S. Greenhouse Gas Reporting Program, a crucial tool for analyzing greenhouse gas emission trends by sector, gas, and over time, has been slated for major cuts in each of Trump’s budget requests, despite being a statutorily mandated function.49 Nearly every program that supports data collection and air monitoring for state, local, and tribal governments or major emitters saw major cuts in both FY 2018 and 2019 requests, but the budget justifications do not clearly distinguish between the data and research functions and other activities such as planning, mitigation, or other environmental management.50 In the best of times, the high-level funding directives enable EPA scientists greater flexibility in designing effective programs, but when the agency’s political leadership prioritizes dismantling climate-relevant activities, the opacity of the EPA budget disables effective oversight and tracking by outside observers. Grants, such as those that make up a large part of the National Science Foundation (NSF) budget, often provide salary funds for faculty and students at universities. Threats or actual cuts to these resources—such as the 42 percent drop in NSF grants containing the words “climate change” between 2016 and 2017—can have ripple effects, not only on research, but also on researchers’ professional opportunities.51 The University of California system’s Academic Senate expressed concern that declines in research funding levels and political interference in grant awards could “negatively impacting their [faculty members’] ability to carry out and further their research” and “constrain … their ability to recommend promotion and tenure to otherwise outstanding researchers who have been denied grants because of political considerations.”52 These changes also affect the more than 55,000 graduate students studying earth, atmospheric and ocean sciences, and physical sciences.53 The Trump administration has taken aim at funding for graduate students broadly, proposing, for example, to reduce the number of NSF Graduate Research Fellowships—the oldest and most prestigious graduate fellowship of its kind—by 1,000 fellows in FY 2018 and 500 in FY 2019.54 In the short term, opportunities for faculty and students may be significantly curtailed, and in the long term, political meddling could dangerously threaten the viability of climate science as a career path. However, below the top lines, some key climate data and science initiatives will still suffer. Most appropriations bills specify funding levels for an agency as a whole—for instance, NASA received $20.7 billion overall—and for offices within that agency—NASA Science received $6 billion.59 Often, appropriators will further specify funding levels for programs within that agency office—within NASA Science, appropriators laid out funding levels for Earth science, planetary science, astrophysics, heliophysics, and a few specific telescopes and major international research projects in the 2018 omnibus appropriations bill. But “NASA – Science – Earth Science” is a $1.9 billion bucket encompassing some 120 operational missions and projects, studying everything from clouds to the water cycle to global climate change.60 Typically, appropriations tables specify funding only to the program level, and committees file what is colloquially known as “report language” in the Congressional Record to provide additional, more granular guidance to agencies on specific congressional priorities. In addition, the White House has the power to submit rescissions requests to Congress detailing budgets for which Congress has appropriated funds that the administration does not want to spend. Once a rescissions request has been submitted, the affected budgets are subject to an automatic freeze for 45 days while Congress considers whether to affirm or deny the cuts.62 The Trump White House’s first, $15.4 billion set of rescissions requests included cutting $10 million from EPA water quality research grants and $50 million from Department of Agriculture (USDA) programs that survey and research land use changes in flood-prone areas.63 The Trump administration could even submit additional rescission requests later in the fiscal year, meaning climate change and data programs could see automatic spending freezes, even if Congress does not revoke their appropriations.64 As of the time of writing this report, Congress has not yet taken action on the first rescissions proposal. Congress is currently considering appropriations bills for FY 2019. 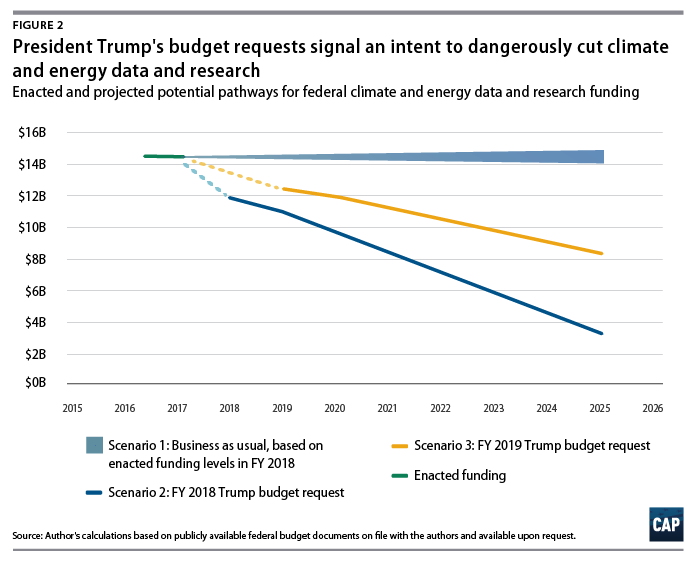 Because that debate is ongoing, this report does not consider additional congressional changes to funding levels for climate data and science programs, and instead only includes reference to the Trump administration’s budget requests. Beyond the proposals to reduce support for or completely defund important climate data and science programs described elsewhere in this report, the Trump administration has time after time taken action to delete or revise public-facing resources on climate change, reassigned government scientists or otherwise limited their activities, and pursued or enacted damaging policy changes. Taken as a whole, these measures illustrate a concerted effort to undermine the credibility of climate science and of scientists in general and to leave both the general public and decision-makers at other levels of government in the dark about the realities of climate change. This section summarizes publicly reported, nonbudgetary attacks directed at climate science by the Trump administration to date. To date, the Trump administration has stopped short of removing public data sets and other foundational climate science resources from federal websites, and most agencies have continued to release new findings. However, many federal agencies have moved or deleted climate change reports, edited language to remove references to climate change, or taken down informational websites. Trump administration political leadership at a number of agencies have taken steps to interfere with climate and environmental scientists’ professional activities, including by reassigning them to other duties, rendering them ineligible to continue serving on advisory boards by changing policies governing those boards, or simply by denying them permission to travel or present their findings at professional conferences. A travel and budget cap imposed by DOI leadership led to a 60 percent drop in the number of U.S. Geological Survey scientists attending the biggest annual gathering of Earth scientists, geologists, and climate scientists in the world, including at least one scientist from the agency’s Climate and Land Use Change mission area, whose travel request was denied just 10 days before the conference. He told The Washington Post he was scheduled to participate in several conference sessions and had helped organize events at the conference, as well as that DOI had denied his travel request even though he had money in his budget to cover his attendance.91 Political appointees at DOI even intervened to remove the top climate scientist and the park superintendent at Montana’s Glacier National Park from the delegation of employees briefing Facebook CEO Mark Zuckerberg when he visited the park in 2017.92 In cases where political appointees prevent federal scientists from presenting their research, traveling, or otherwise accurately communicating their work, the funding levels approved by Congress for the functioning of those programs matters little because the data never sees the light of day. This chilling atmosphere for scientists has helped contribute to an exodus of expertise among career federal staffers, particularly at the EPA. In 2017, more than 700 people left the EPA, including more than 200 scientists. For the most part, those who have left are not yet being replaced; of 129 EPA hires in 2017, just seven were scientists.93 These departures represent decades—if not centuries—of cumulative experience, and it will take years and significant investment to begin to undo the damage. The Trump administration has also pursued a number of administrative policy changes that undermine the past conclusions of climate science and seek to diminish the use of public health and environmental data in future agency decisions. A Pentagon report on physical threats to military installations around the world that was initially drafted during the Obama administration was revised prior to release to remove 22 references to climate change and make other substantive changes, including deleting a map showing the risk of sea level rise to specific sites.97 Retired U.S. Navy Vice Adm. Dennis McGinn told The Washington Post, “The wordsmithing, not saying ‘climate,’ I could live with that. But taking out … maps of critical areas of flooding, that’s pretty fundamental.” Failure to directly name the threats facing military installations and operations and removing data from public reports could make it that much harder for commanders at vulnerable bases to gain approval for infrastructure and other investments to protect their facilities and service members from the impacts of climate change. Once again, two of the most significant attacks on climate science have been launched by the Trump EPA. The agency dramatically reduced two technical values used to calculate benefits from climate change-related rule-makings, cutting the social cost of carbon from $42 per ton to between $1 and $6 per ton, and reducing the social cost of methane from $1,400 per ton to $55 per ton, despite the fact that many experts believe the social cost of carbon should have been pegged higher.100 “This was not evidence-based policymaking, this was policy-based evidence-making,” former Council of Economic Advisers member Michael Greenstone told E&E News about the decision to dramatically reduce the social cost of carbon. The move means that the federal government will not be accurately considering the future economic costs of climate change, even as Trump administration appointees seek to roll back rules limiting greenhouse gas pollution. Since assuming power, President Trump, his administration, and his congressional allies have targeted the data and research that inform the public about the reality of climate change. The Trump White House’s budget proposals, detailing dramatic cuts to climate and energy data and science programs, set the tone for political appointees throughout the government to seek ways to circumvent the will of the congressional appropriators who rejected those cuts—whether it is by removing or editing public-facing resources, interfering with federal scientists’ professional activities, or tampering with or canceling programs in a manner that violates the spirit, if not the letter, of the law, as with the elimination of the NASA Carbon Monitoring System discussed earlier in this report. Data may be lost, scientists may lose their funding or jobs, and the quiet destruction of the federal climate and energy data and research endeavor may go by without notice. The survival of climate and energy data and research should not—and cannot—depend on President Trump’s or his allies’ discretion. Policymakers, analysts, reporters, and the public need to be vigilant in monitoring how agencies spend the dollars Congress has appropriated, particularly in light of the significant policy changes to how agencies use scientific data detailed throughout this report. 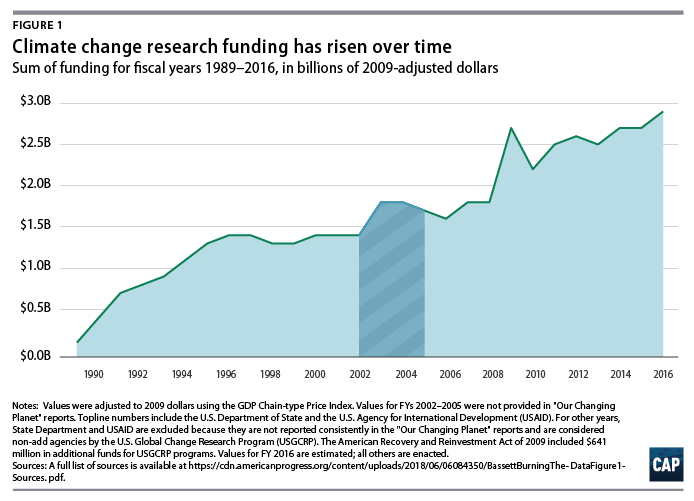 In addition, as noted previously, interruptions to individual program budgets at agencies with multiyear funding cycles— such as the DOD—could result in long-term delays in advancing climate science, and interference with grantmaking to academic institutions at the National Science Foundation, the EPA, and other agencies could cause lasting damage to the United States’ research and science base. In future reports, CAP will continue to monitor and report on the relationship between congressional appropriations for climate and energy data and research programs and consequent agency funding, personnel management, and policy decisions. Muzzling scientists, attempting to defund research programs, and subjecting grant solicitations to political screenings will not alter the reality of climate change, but it will lead to more Americans who, in Arendt’s formulation, “no longer can believe anything.” Climate change doesn’t care whether you believe in it or not. It is both a scientific fact and, increasingly, a lived reality for millions of Americans whose lives have been destroyed by devastating wildfires, floods, and storms. And the American government owes them—and all of us—the courtesy of telling the truth. Lia Cattaneo is a research associate for Energy and Environment Policy at the Center. The authors would like to thank John Podesta, Ernest J. Moniz, John M. Deutch, Ryan Richards, Alison Cassady, Danielle Schultz, and numerous other champions of climate and energy data and research programs and scientific integrity for their contributions to this report.